Yesterday’s North American League Championship Series ended in an upset for Cloud9, but marksman player Zachary “Sneaky” Scuderi can’t feel too bad. His plays on Tristana during the final game of the series were easily the highlight of that day’s games. In a fight at Baron Nashor, the giant purple beast that rewards an empowering aura to the team that slays it, Dignitas were trying to stand their ground against C9 and secure the Baron boon for themselves. When Cloud9 works its way in to engage, two members of Dignitas fall to low health and try to run away, leading Scuderi to pursue even with a small sliver of health. 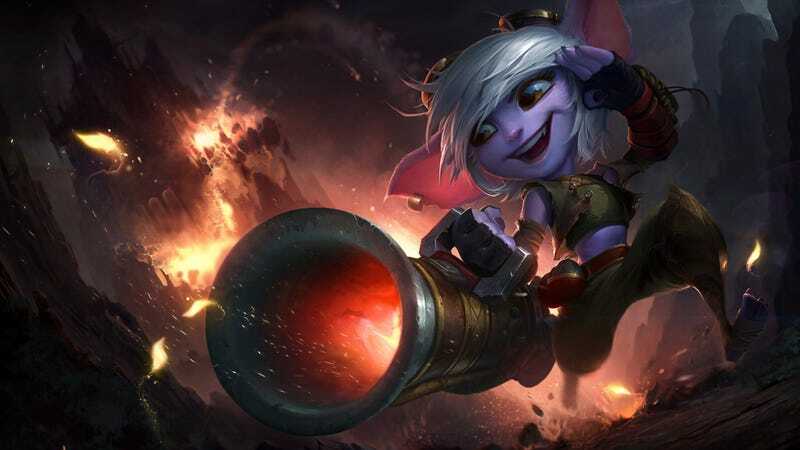 Tristana is a long-ranged marksman by nature, using her cannon to pick apart foes from a distance. Though her Rocket Jump leaps her into dangerous proximity, kills refresh its cooldown. Scuderi uses that to leap in, pick off two members, leap away and then use his range to finish off the third member of Dignitas. Though Scuderi easily made the play of the day, Dignitas pulled the match out later, where another engagement outside the Baron pit went to Dig’s advantage instead. Dignitas closed out the series 3-1, taking the game over C9 and moving on to the semifinals to play either Immortals or Team SoloMid. The loss not only dropped Cloud9 out of the playoffs, but guaranteed Team SoloMid a spot at this year’s Worlds due to league points.